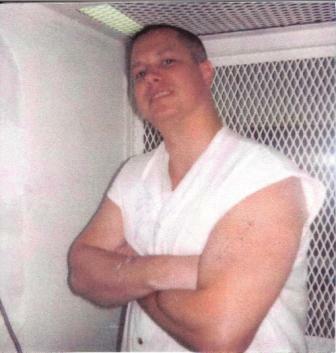 If you like for a first contact: CharlesThompson@deathrow-texas.com , please leave a regular address for response. Thank You. Book title: the grass beneath his feet - the charles victor thompson story. Nothing produced a glaw in his eyes like the wonders of nature provoking his every curiosity. everything about nature appealed to his meticulous character and his childhood was invested at mediana lake, chasing down fireflies and fishing. there was nothing he likes better than fried perch and eggs for breakfast. So how does such an innocent boy end up on death row in what most agree is the most relentless State for executing murders ? 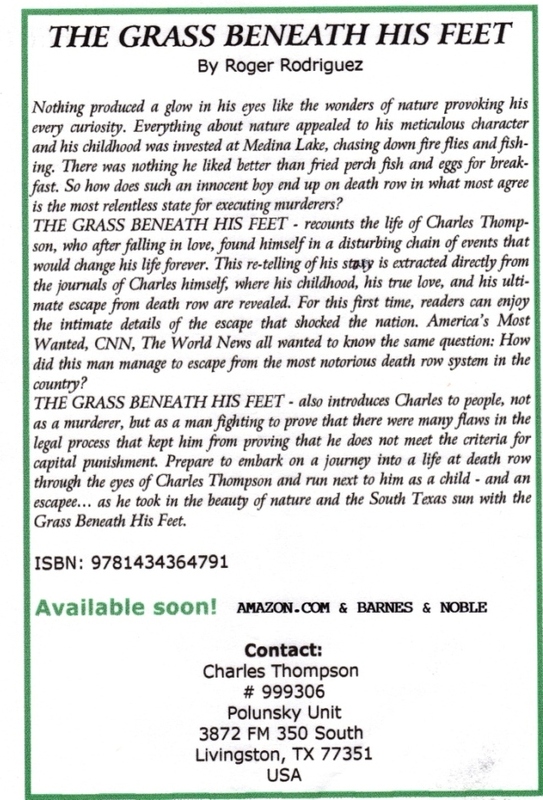 THE GRASS BENEATH HIS FEET -recounts the life of charles thompson, who after falling in love; found himself in a disturbing chain of events that would change his life forever. This re-telling of his story is extracted from the journals of charles thompson himself, where his childhood, his true love, and his ultimate escape from death row are revealed. For this first time ever, readers can enjoy the intimate details of the escape that shokced the entire nation. America's Most Wanted, CNN, The World News all wanted to know the same question: HOW did this man manage to escape from the most notorious death row system in the country? THE GRASS BENEATH HIS FEET also introcuces charles to the people, not as a murderer but as a man fighting to prove that there were many flaws in his legal process that kept him from proving that he does not meet the criteria for capital punishment. Prepair to embark on a journey into a life at death row through the eyes of charles thompson and run next to him as a child and an escapee... as he took in the beauty of nature and the south texas sun with the grass beneath his feet. Hello from Texas infamious death row. I've been a prisoner of the state for many moons - since 1999.  I am looking to correspond with people i can trust to share my feelings with, my thoughts & life. Someone who will enter a friendship with an open mind and not judge, but accept me as a person who really wishes to add a friend to his life. I'm seeking help in the plight for my life, I value, and educated opinion. I admire those who fight for whats right & seek the truth, those who put the good foot forward - who fight the good fight. Its takes integrity, courage and valour to stand in the face of insurmountable adversity. I play no games, I'm upfront and a very politically active pro-active prisoner and an individual. I strive to not just be another faceless number in the Abyssmal system. I'm a Caucausian male in his 30's who considers himself handsome, well read, intelligent and openminded. I don't subscribe to stereotypes or labels. My hobbies are reading, writing various articles to bring awareness. I enjoy all music. I love sports, the great outdoors, hiking, camping, sking, moter cycles and mountains, fishing. Campaigning and prostesting - many a thing! I'm looking for friends & supporters with caring hearts, mature intelligent and able minded folks who can form an educated opinion. If you can identify with any of these write me, we have something in common already. Death Row can be a really lonely experience. I am a firm beliver in having fun! If you wish to embark into my world I assure you it won't be boring. Please take action, get involved in my struggle, share in my life and its ever lasting pwersuit of liberty and happyness. I've got alot of character & enjoy sharing in lifes journey. I await your response - please accept my thanks! Hallo aus dem berüchtigten Todestrakt in Texas. Ich bin ein Gefangener des Staates seit vielen Monden – seit 1999. Ich möchte mich gern mit Leuten unterhalten, denen ich meine Gefühle, meine Gedanken und mein Leben anvertrauen kann. Jemand der eine offene Freundschaft ohne Vorurteile eingehen möchte der mich als eine Person akzeptiert die sich wirklich einen Freund für’s Leben wünscht. Ich suche Hilfe für diese Notlage meines Lebens, ich weiß eine gebildete Meinung wirklich zu schätzen. Ich bewundere diejenigen, die für das, was Recht ist kämpfen und die Wahrheit suchen, diejenigen, die den guten Fuß voran setzen – die den Kampf für das Gute kämpfen. Man benötigt Integrität, Mut und Tapferkeit um unüberwindbarem Unglück entgegenzustehen. Ich spiele keine Spielchen, bin offen und ehrlich, politisch aktiver pro-active Häftling und ein Individuum. Ich versuche, nicht nur eine weitere gesichtslose Nummer in diesem entsetzlichen System zu sein. Ich bin ein männlicher Weißer in seinen 30ern, der sich selbst für hübsch, belesen, intelligent und aufgeschlossen hält. Ich halte nichts von Vorurteilen. Meine Hobbies sind lesen und verschiedene Artikel schreiben um Leute Aufmerksam zu machen. Ich mag jegliche Musik. Ich liebe Sport, die freie Natur, wandern, camping, skifahren, Motorräder, Berge und angeln. Kampagnen und protestieren - viele Dinge! Ich suche Freunde und Unterstützer mit mitfühlenden Herzen, reifer Intelligenz und Klugheit die eine fundierte Meinung bilden können. Wenn Sie sich mit irgendeiner dieser Eigenschaften identifizieren können schreiben Sie mir, wir haben jetzt schon etwas gemeinsam. Der Todestrakt kann wirklich eine sehr einsame Erfahrung sein. Ich glaube ganz fest ans Spaß haben. Wenn Sie sich in meine Welt begeben möchten versichere ich Ihnen, dass es nicht langweilig wird. Bitte handeln Sie, engagieren Sie sich in meinem Kampf, teilen Sie mein Leben und das ewige Streben nach Freiheit und Glück. Ich habe viel Charakter und genieße den Austausch auf der Reise des Lebens. Ich erwarte Ihre Antwort - bitte nehmen Sie meinen Dank an!